The Carrick-On-Suir man has won four out of the five stages so far in the Tour of Turkey. 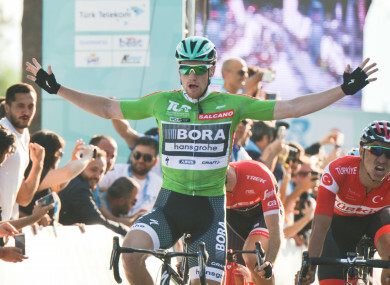 IRELAND’S SAM BENNETT has taken his fourth stage win from five at this year’s Tour of Turkey. After winning the first three stages of the race, the Bora–Hansgrohe cyclist lost the leader’s jersey yesterday, finishing second last on the steep stage 4 route, but remains top of the points classification. More comfortable as a sprinter, Bennett was content to complete the stage yesterday, keeping some juice in the tank for today’s 166km penultimate stage from Selcuk to Izmir. It was just as well, as he found himself doing a lot of work on his own going the later part of the stage, as some of his teammates had been caught up in a crash earlier on in the day. The Carrick-On-Suir man goes into tomorrow’s final stage seven points ahead in the points classification, but 52nd overall, due to yesterday’s stage. The Italian Diego Ulissi sits in first place in the overall classification, having won yesterday’s stage. Closest on Bennett’s heels in the points classification is the Belgian Edward Theuns, who came in second twice behind Bennett this week. Tomorrow’s final stage will see the riders cycle 135km to finish up in Istanbul. Email “Sam Bennett clinches fourth stage win of the week in Turkey”. Feedback on “Sam Bennett clinches fourth stage win of the week in Turkey”.